Lipids and cholesterol are essential for the normal functioning of the body. They are key components of cell membranes that separate different intracellular structures and provide the boundary between the cell and its environment. Cholesterol is also needed in the production of hormones. Triglycerides are used to store energy ready for release when needed by muscles. Lipoproteins are special particles providing the body's solution for transporting water insoluble fats, namely, triglycerides and cholesterol, around the body. They comprise a central droplet of fat surrounded by a single-layer shell of phospholipids. The phospholipids have a hydrophobic head that is attracted to the fat and a hydrophilic tail that is attracted to the saline solution that makes up blood. 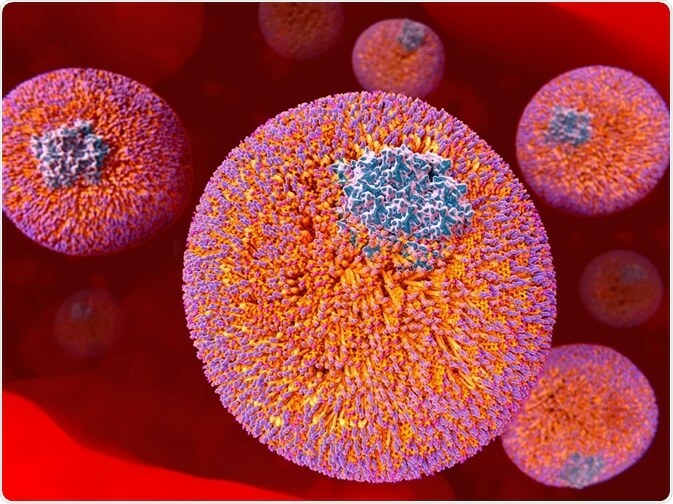 Lipoprotein particles form in the small intestine and liver and carry their lipid cargo in the blood to other tissues in the body, and particularly the liver where cholesterol is metabolized and adipose tissue where triglycerides are stored. There are several different types of lipoproteins that are classified according to the specific proteins attached to the phospholipid outer layer. These are called apolipoproteins and they help stabilize the lipoprotein particle and can bind to cell surface receptors at the destination tissue, so the lipoprotein can be taken into the cells by receptor-mediated endocytosis. The least dense lipoproteins are chylomicrons that deliver lipids and cholesterol from the intestines to the muscles, adipose tissue and the liver. Very low-density lipoprotein (VLDL), which transport lipids and cholesterol that are synthesized in the liver, carries five different apolipoproteins (apoB100, apoC1, apoC2, apoC3 and apoE). Intermediate-density lipoproteins, refer to a density between VLDL and low-density lipoproteins (LDL), which carry multiple copies of the apolipoprotein apoE and a single copy of apoB100. LDLs comprises mainly of cholesterol, only carry apolipoprotein apoB100. The most dense lipoprotein is high density lipoprotein (HDL), which is primarily associated with apoA1. HDL removes cholesterol from the blood and transports it to the liver, and so high levels of HDL can reduce the risk of developing heart disease or stroke. ApoC3 is one of the small apoproteins associated with lipoprotein particles. It is produced mainly by the liver and intestine and is thought to inhibit hepatic uptake of triglyceride-rich particles, delaying their breakdown1. Indeed, it has been shown that plasma apoC3 levels are directly correlated with plasma triglyceride levels and inversely related to triglyceride clearance after fat ingestion. It therefore appears that apoC3 plays an important role in regulating triglyceride metabolism. ApoC3 is found on VLDL, which seems logical since VLDL is designed to transport newly synthesized lipids from the liver and it would be wasteful for these to be transported directly back into the liver and be broken down. However, apoC3 is also found on HDL, which would appear counter-intuitive since the role of HDL is to clear lipids from the blood and take them to the liver to be broken down. There were concerns that the presence of apoC3 on HDL may hinder the beneficial function of HDL and make it increase rather than decrease the risk of cardiovascular disease. The relationship between these two entities and their place in lipid profiling has thus been the focus of much research. Approximately half of plasma apoC3 becomes incorporated into HDL and the rest associates with either VLDL or chylomicrons2. It is now known that the apoC3 does not simply bind HDL particles. On the contrary, the union is strictly controlled. ApoC3-HDL only arises as a result of de novo biosynthesis in the liver and requires the presence of lipid transporter ABca13. ABca1 and apoC3-HDL have been shown to play key roles in the prevention of apoC3-induced hypertriglyceridemia in mice3. In vitro studies also indicate that apoC3-HDL plays a role in the catabolism of triglyceride-rich lipoproteins. ApoC3-HDL prevents excessive amounts of apoC3 presenting on VLDL, whereby ensuring that triglycerides can be hydrolyzed in the liver and do not build up in the blood3. It is therefore clear that apoC3-HDL is important for maintenance of plasma triglyceride homeostasis. Indeed, apoC3-HDL shows a positive correlation with the morbidly obese phenotype. Thus, it is becoming apparent that the function of HDL, as determined by the associated apolipoprotein is the real indicator of atheroprotection rather than HDL levels alone. Until recently, the effect of apoC3 on the function of HDL in adipose tissue was unknown. The direct effects of apoC3 expression on HDL and on metabolic activity in white adipose tissue (WAT) and brown adipose tissue (BAT) have now been investigated 4. HDL extracted from mice infected with an adenovirus expressing human apoC3 was analyzed for its apolipoprotein and lipid composition. The metabolic activity of BAT and WAT cells was also investigated through analysis of their mitochondria. Serum metabolomic analysis was performed using a Bruker Avance III HD 700 MHz nuclear magnetic resonance spectrometer equipped with a TCI cryogenically cooled probe. The results showed that apoC3 modulates HDL structure and function, and selectively promotes BAT metabolic activity. This latest research indicates, contrary to previous belief, that apoC3 possesses some very important properties and is needed for optimal health. Reducing apoC3 to moderate levels may be beneficial for the treatment of certain types of hypertriglyceridemia, but some apoC3 expression is essential for normal lipid metabolism. Mendivil CO, et al. Metabolism of very-low-density lipoprotein and low-density lipoprotein containing apolipoprotein C-III and not other small apolipoproteins. Arteriosclerosis, Thrombosis, and Vascular Biology 2010;30 (2): 239–245. Onat A, et al. Apolipoprotein C-III, a strong discriminant of coronary risk in men and a determinant of the metabolic syndrome in both genders. Atherosclerosis 2003;168: 81‑89. Zvintzou E, et al. Pleiotropic Effects of Apolipoprotein C3 on HDL Functionality and Adipose Tissue Metabolic Activity. J Lipid Res. 2017;58(9):1869‑1883.